The Association of Southeast Asian Nations (ASEAN) is a coalition of 10 countries that have been experiencing accelerated economic growth in recent years, and is forecasted to exhibit robust economic growth at an annual average of 5.1% between 2018 – 2022. The association is predicted to be the world’s fourth largest economy by 2050 with digital transformation expected to be a significant contributor to its growth. One of ASEAN’s main focus is the fourth industrial revolution or Industry 4.0 as a catalyst to increase avenues of future growth. ASEAN Member States are rapidly establishing visions and policies to integrate technologies such as Internet-of-Things (IoT) and Artificial Intelligence (AI) into their country, with the aim to be leaders in the global and regional digital economy. Industry 4.0 will have significant impact on ASEAN given that manufacturing accounts for more than 35% of ASEAN’s GDP and is valued at over a trillion USD. Productivity increases from Industry 4.0 technology adoption is estimated to net between $216 and $627 billion in economic gains annually by 2025. Industry 4.0 is steadily taking root amongst ASEAN Enterprises. 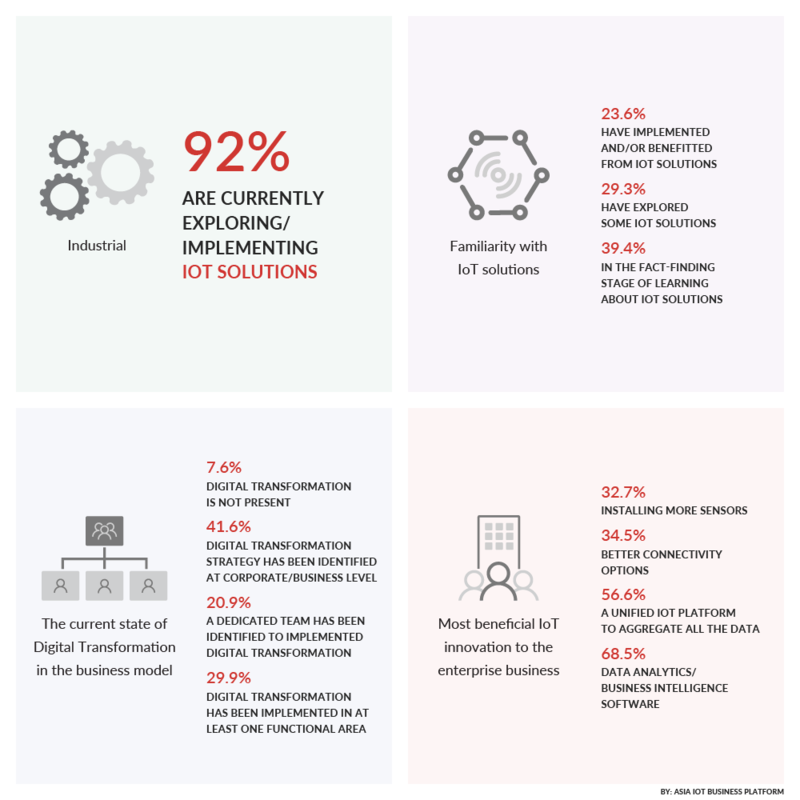 Survey results from Asia IoT Business Platform in 2018 showed that 92.41% of the 685 respondents from the Industrial sector across Malaysia, Thailand, Philippines, Indonesia and Vietnam are currently exploring and/or implementing IoT as part of their digital transformation efforts. 68.5% of respondents also cited that Data Analytics/Business Intelligence software to make sense of the data collected from their machines would be most beneficial to their business objectives. One of the successful implementation case studies come from Siam City Cement, the second largest cement producer in Thailand. The company’s first Industry 4.0 plant in the country focused on creating a pervasive network which acted as the key enabler. After which services such as robot-assisted inspections and predictive maintenance capabilities using analytics and machine learning and a remote Operations Center combining both IT & OT could be implemented. The implementation of these digital capabilities has helped to reduce maintenance costs, unplanned downtime and increased productivity. Two of the ASEAN’s largest food conglomerates based in Thailand, Thai Beverage Group (ThaiBev) and Charoen Pokphand (CP), have started initiatives to further accelerate adoption of robotics into their manufacturing process. The initiatives include R&D subsidiaries and talent development programs to sustain future efforts in adopting Industry 4.0 technologies. Thailand’s government is not alone in setting goals and regulations relating to Industry 4.0.. Countries such as Malaysia and Indonesia have set out clear goals and regulations with roadmaps like the Industry4wrd Policy and Making Indonesia 4.0. A short summary of these policies can be found below. Launched in late 2018, The Industry4ward Policy was developed and introduced to provide a comprehensive transformation agenda for the manufacturing sector. Under the policy, the Malaysian Government will establish an Industry Digitalisation Transformation Fund of RM 3 billion with a 2% interest subsidy. This fund is set to accelerate the adoption of Industry 4.0 technologies. To further incentivise the industry to invest in automation and modernisation, RM2 billion will be provided to SMEs, under the Skin Jaminan Pembiayaan Perniagaan (SJPP) loan guarantee program, where up to 70% of the amount financed is guaranteed by the Government. Thailand is a front runner in Industry 4.0 policy making, with the 2016 identification of 5 S-Curve industries. In 2018, the policy was updated to include 5 more S-Curve industries. Out of the 10, the industries with highest foreign direct investment are automotive, petrochemical, and electrical and electronics. During Asia IoT Business Platform Thailand, Thailand’s Digital Economy Promotion Agency (depa) shared that the focus for Thailand 4.0 will be on the new S-curve industries: digital, robotics and automation, aviation and logistics, biofuels and biochemicals, and medical hub. The country also launched the Eastern Economic Corridor in 2017 which houses the Digital Park Thailand that is set to lead the country’s digital transformation efforts. The Digital Park aims to be a digital hub and offers cutting edge digital infrastructure such as ultra-high-speed broadband and data centres. Philippines has been actively promoting digitization through various initiatives including Inclusive Industrial Strategy (i3s). This initiative aims to enhance the competitiveness of industrial, logistics, agriculture and commerce sectors in the country. In parallel, the Manufacturing Resurgence Program (MRP) is looking to rebuild existing capacity of industries, strengthen new ones and maintain the competitiveness of industries with comparative advantage and aims for the Philippines to be a hub for automotive, electronics, garments and food manufacturing. However, challenges such as stable and reliable connectivity infrastructure, established policies and roadmap and industry collaboration still persist. In which the government has allocated 1.4billion USD to strengthen digital infrastructure. IoT will play a crucial role in realising Indonesia’s Industry 4.0 initiative named, ‘Making Indonesia 4.0’, which was launched in mid 2018, spearheaded by Ministry of Industry. Similar to other neighbouring countries, this Industry 4.0 initiative aims to enhance efficiency and productivity of the local enterprises which in turns, improve their business competitiveness in the regional and global market. In the “Making Indonesia 4.0” roadmap, five sectors are named priority sectors: food and drinks, automotive, textile, electronics, and chemicals. Indonesia seeks to be among the leading global players in these five sectors of the world economy. As such, these sectors are envisaged to boost the country’s exports in the future and increase the manufacturing sector contributions towards Indonesia’s GDP. The roadmap is expected to boost Indonesia’s real economy by between 1-2% with annual GDP growth rates expected to range at 6%-7% between 2018 – 2030. The prime minister affirmed that enhancing global connections and building more partnerships will be key to Vietnam’s developmental process. Key solutions include enhancing cooperation with foreign corporations in accessing and adopting Industry 4.0 as well as promoting relations with other countries, international organisations, and multinational enterprises to select suitable models and experiences for application in Vietnam. As ASEAN embraces the Industry 4.0 revolution, there is a need for collaboration across countries. Each member state has niche area to focus on and accelerate digital development in the region. The focus on intra-ASEAN collaboration and partnerships allows each member state to reap the benefits of other member states’ developments and vice versa without needing to waste additional resources on similar research in other member states’ niches. As digital transformation continues to sweep through ASEAN, enterprises in the manufacturing sector must continue to adopt new technologies to improve their competitiveness and ensure their relevance to the market. Keep up with the latest developments at Asia IoT Platform. If you are interested to know more and be involved in the discussions on Industry 4.0, do drop us a message at info@industry-platform.com or register your interest at http://bit.ly/2DGv8Ad.